There is no better time than now to think about updating the exterior of your home. A small facelift is just what your abode needs to feel rejuvenated after a long winter. And while the idea of an outdoor makeover may seem daunting, a little bit goes a long way when it comes to boosting curb appeal and adding some oomph to your home’s outward appearance. These easy outdoor project ideas can each be completed in as little as one weekend—even one day—and can likely be done yourself. If you feel up to a little bit of painting, a revived front door—the focal point of curb appeal—could be the ticket to instantly updating your home. Choose a not-so-neutral color to make your entryway really pop. Bold aquas and greens look great against a tan or brown house while bright red stands out on a gray or white house. Don’t be afraid to experiment here since bright and bold doors are all the rage, are an inexpensive update, and can easily be repainted. All you need is the paint color of your choice, a flat brush, and a painter’s tray and tape. 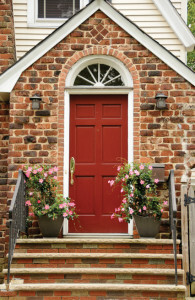 Try transitioning this exterior update to the inside of your home by painting the other side of the door as well. 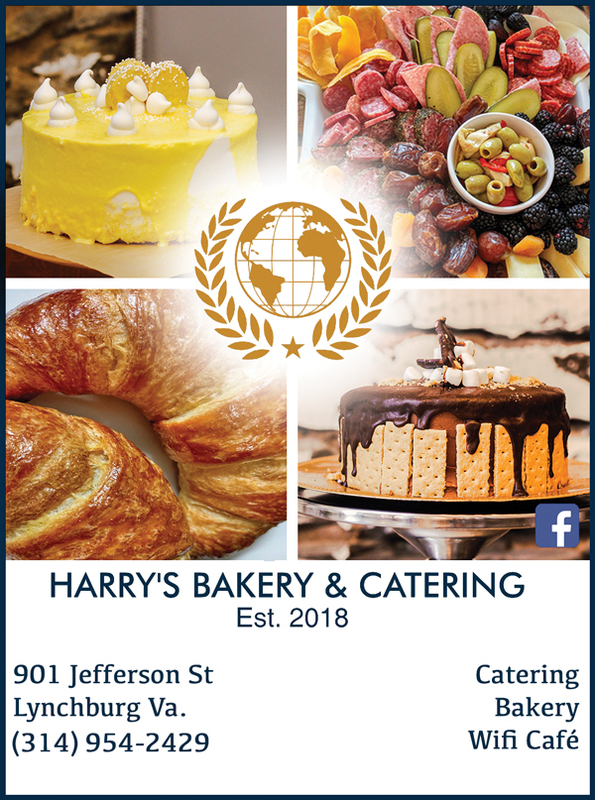 On the other hand, you can reflect your home’s interior on the outside by adding a decorative wreath or oversized monogram that reflects your personal taste and style. Updating your house numbers, door knobs and door knockers are small but effective ways to give your exterior a stylish look. 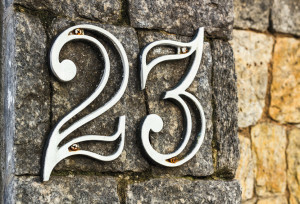 There are so many DIY projects out there for modernizing your house number. 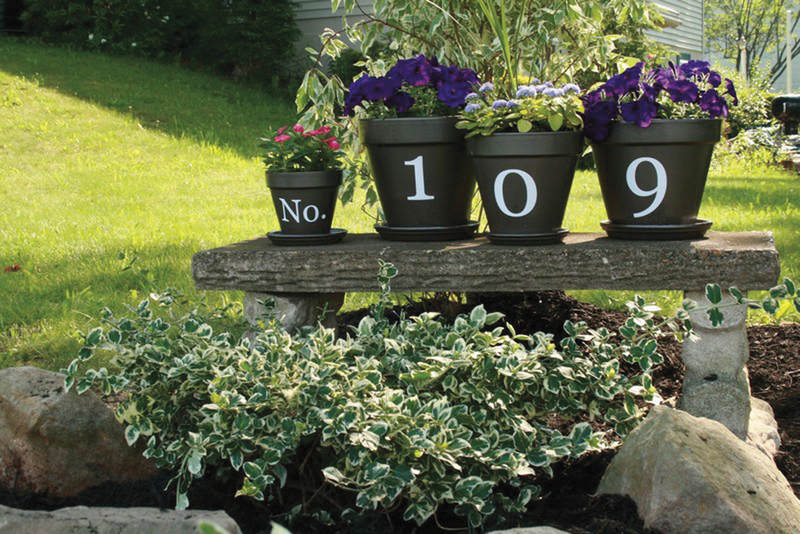 Think big, fancy fonts in stainless steel or aluminum affixed to the face of the house, or a display of various potted plants arranged on the front porch with numbers painted on the sides. If you have the space, add a cute bench out front with a bright and colorful pillow featuring your house number in a bold applique to really make a statement. Get rid of those old, shiny brass door knobs and replace with bronze or another favorite metal. If you don’t like the idea of buying and replacing your door hardware, try using a metal spray paint to quickly update the look and feel of your knobs and hinges. If you are looking for something more unique, be sure to scour local antique shops. Adding an old, interesting door knob or door knocker with intricate details and designs to your front door can really give your house the perfect dash of character. 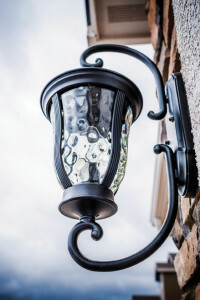 Properly illuminating your home’s wonderful features is key to curb appeal. And this doesn’t have to be an expensive or time-consuming project. Install solar lighting along your sidewalk leading up to your house to make a large impact with little effort, making your home feel warm and inviting instantly. Solar lighting does not require any wiring and can be purchased at any home improvement store. If you’re up for spending a little more, add a large overhead chandelier- or lantern-like light fixture to your front porch to accent your house and create a warm, welcoming entryway. (Consider calling in the electrician on this one if you have no electrical experience.) If you have porch lights on either side of the front door, consider updating them as well so they match the door’s hardware. Symmetry and fluidity are important factors to consider when it comes to creating curb appeal, as pieces that flow together are pleasing to the eye. Your mailbox may be one of your least worries, but it’s likely one of the first things people see when they arrive at your home. Let it set the tone and complement your home while expressing your personality. Try using indoor/outdoor spray paint for a metal mailbox. Two coats should do it and will dry in less than an hour. Think about choosing a fun, bright color for the box—such as a turquoise-blue with a shiny red flag—and white with large black house numbers for the post. If you have more conservative tastes, paint your mailbox black or white for a more classic look. Paint the wooden post or pole to match or complement your home’s exterior color. Add your house numbers down the post in a contrasting color, making sure they are clearly visible. 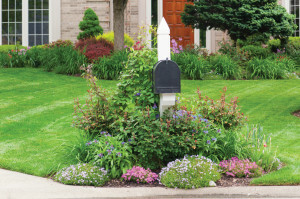 Surround your mailbox with a beautiful flowering garden or a small, simple bed of rocks with hardy ferns. Each of these done-in-a-day projects allow you to express yourself and add instant pizzazz to your home. To complete your home’s fresh, new look, be sure to manicure your lawn, tend to any shrubs and bushes, wash dirt off of sidewalks and driveways, and wipe down the windows to make your home sparkle and shine. I love the house numbers in the photo. Do you know where I can buy these? Thanks!